Xpression Sessions is in its second wave, hitting Albuquerque every second and fourth Friday at 5 p.m. A youth-oriented artist workshop program, it’s sponsored by Warehouse 508 (508 First Street NW). Its frontman and main mover is Noah Kessler De St. Croix. He’s devoted himself to the program by fundraising, fanning public interest and coming up with the idea in the first place. His aim is to give the youth of Albuquerque a free outlet for their artistic impulses by pairing them with safe venues like Warehouse 508 and artists who can mentor them in the modern arts. The goal of the Sessions is simple, says Kessler De St. Croix: “We are devoted to creating a space to support the cycle of educating youth and providing an opportunity for local artists to share their skills with the community. This not only generates local economy, but connects our community in a unique and positive way.” By bringing in experienced Albuquerque artists and paying them to work with the youth, the program establishes cultural and economic revenue for everyone involved. It gives artists the chance to mentor the next generation of creative minds and gives youth an opportunity to glean skills and savvy from successful mentors. The guest artists brought in to lead the workshops possess multifarious skills. They are vetted and professional as well as locally revered. Kessler De St. Croix’s lineup includes Ben Shaw, Mooxie, CloudFace, Lisa Casaus and Melvin Mayes. The next workshop will be led by Mooxie on July 26 and will focus on urban-edged illustration using pen, India inks and watercolors. 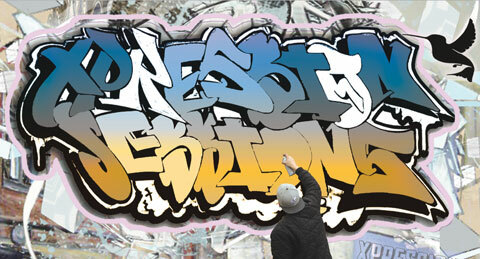 Mooxie’s style is fresh and urbane, characterized by bold lines with a stylized rough finish. All Xpression Sessions are free, with materials provided by Warehouse 508.